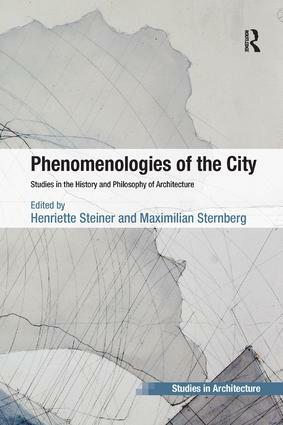 Phenomenologies of the City: Studies in the History and Philosophy of Architecture brings architecture and urbanism into dialogue with phenomenology. Phenomenology has informed debate about the city from social sciences to cultural studies. Within architecture, however, phenomenological inquiry has been neglecting the question of the city. Addressing this lacuna, this book suggests that the city presents not only the richest, but also the politically most urgent horizon of reference for philosophical reflection on the cultural and ethical dimensions of architecture. The contributors to this volume are architects and scholars of urbanism. Some have backgrounds in literature, history, religious studies, and art history. The book features 16 chapters by younger scholars as well as established thinkers including Peter Carl, David Leatherbarrow, Alberto Pérez-Gomez, Wendy Pullan and Dalibor Vesely. Rather than developing a single theoretical statement, the book addresses architecture’s relationship with the city in a wide range of historical and contemporary contexts. The chapters trace hidden genealogies, and explore the ruptures as much as the persistence of recurrent cultural motifs. Together, these interconnected phenomenologies of the city raise simple but fundamental questions: What is the city for, how is it ordered, and how can it be understood? The book does not advocate a return to a naive sense of ’unity’ or ’order’. Rather, it investigates how architecture can generate meaning and forge as well as contest social and cultural representations. Contents: Introduction, Henriette Steiner and Maximilian Sternberg. Part I Urban Order and the Lived City: Convivimus ergo sumus, Peter Carl; Squaring the city: between Roman and Rabbinic urban geometry, Gil P. Klein; Medieval moderns? Cistercians and the city, Maximilian Sternberg; The proximity of difference and the three cities of Copenhagen, Henriette Steiner. Part II Culture and the Natural World: Atmospheric conditions, David Leatherbarrow; Art Nouveau gardens of the mind: bell jars, hothouses, and winter gardens - preserving immanent natures, Amy Catania Kulper; Burning the grove: from the celestial garden to the picturesque landscape in Baroque England, Robert Ferguson; The garden and the city: fragmented dreams of totality, Mari Hvattum. Part III From Fragment to City: Between architecture and the city, Dalibor Vesely; Early debates in modern architectural education: between instrumentality and historical phronesis, Alberto Pérez-GÃ³mez; Gothic of the Murdered God: from the crystal creed to the spirit of abstraction in modern German architecture, Gabriele Bryant; Corporeal spatiality and the restorative fragment in early twentieth-century art and architecture, Dagmar Motycka Weston. Part IV Urban Discontinuities: Agon in urban conflict: some possibilities, Wendy Pullan; A fragment in the city: the Behind the Iron Gate housing estate, Gabriela Åšwitek; The phenomenology of food, Carolyn Steel; Changing places: navigating urbanity in the global South, Matthew Barac. Index. Henriette Steiner is Associate Professor in the Section for Landscape Architecture and Planning at the University of Copenhagen in Denmark and Maximilian Sternberg is a Lecturer in Architecture at the University of Cambridge, UK.